A nomadic gatherer, a woman of the mountains, who knows their every secret and breath. 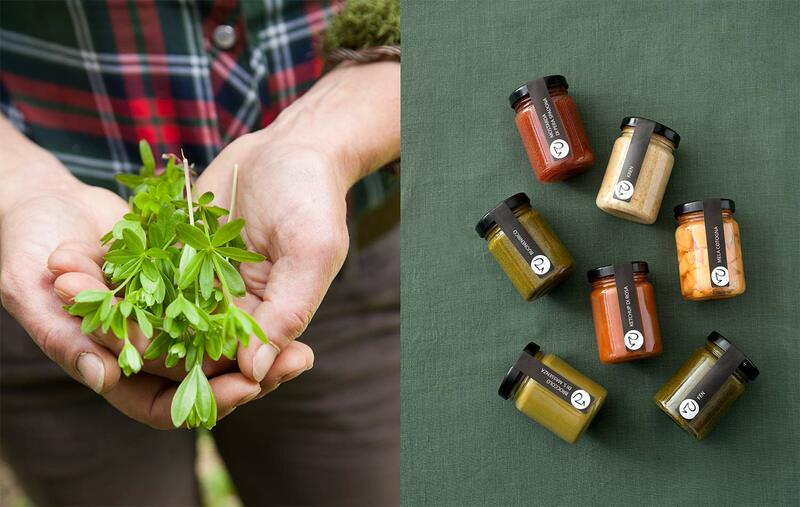 A trip high up into the mountains in search of energy, life, and the taste of hand-gathered wild herbs, bottled while still emanating the scent of forest and chilly air. One day in the far future, Eleonora Cunaccia’s grandchildren will refer to their grandmother as nonna Noris, and tell their children, nephews and nieces her story during the chilly nights in Rendena Valley. The tale of nonna Noris will be a fairy tale, recalling wood elves and enchanted forests. She is a mountain elf, a figure between fairy tale and myth. Noris passes entire days by herself in the middle of these forests, trekking beside rivers and white-water streams under rain and sun. She is searching for one of Mother Nature’s spontaneous gifts – her precious herbs, which she knows well how to find and recognize. She wields an ancient knowledge that has long since been forgotten in most parts of the world. From the fruits of her ancient knowledge, the Primitive Botanic Office (Officina Botanica Primitivizia) was created in 2003. Rather, it was re-created, a new beginning for something rooted deep and strong in the rediscovery of its origins. The year Primitivizia was founded, Noris and her brother Giovanni had decided to return to their hometown after years of experience in the world of high-class food and beverage. They wanted to give life to a restoration project in order not just to find lost flavors, but to revive a cultural tradition that deserved to be remembered and passed down. What Noris does today out of passion was exactly what her mother, grandmother, and great-grandmother did simply to survive, feed themselves, and heal themselves. They passed on a matriarchic wealth of knowledge for generations. Moving from barn to barn between mountain slopes and valley brooks, Noris gathers wild, local herbs. Now she lives according to the seasons and cycles of nature. Her patient work begins in springtime in the lower valley where the snow is first to melt, allowing watercress and dandilions to sprout. 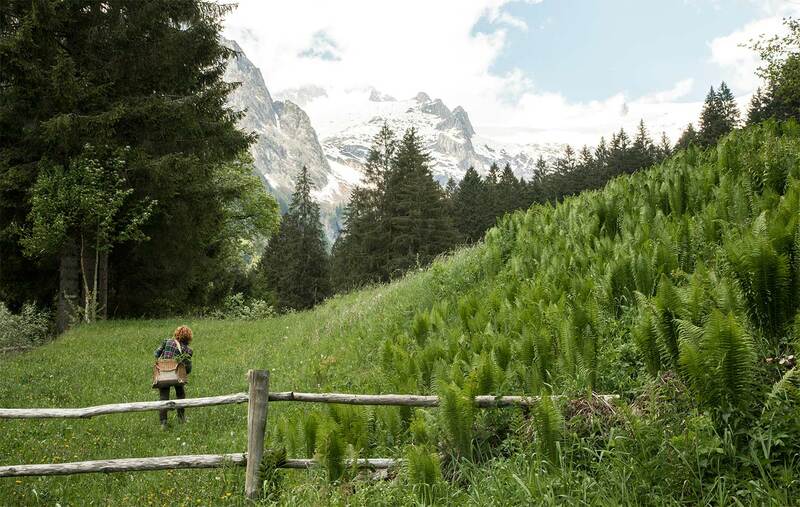 In June, she climbs into the Alpine mountains to a height of 1600 to 2000 meters, where she finds nettles and burdock. In the summer, she climbs up to 2200 meters in search mountain pinecones and Alpine radicchio, a token herb of high altitudes. Every evening after twilight, Noris returns to her town. She follows paths now hidden in the dark like a sure-footed mountain goat with her wicker basket full of treasures. She heads towards the laboratory of Primitivizia where Giovanni awaits her. Her brother, a chef-turned-alchemist, expertly cleans and prepares the herbs she brings, capturing their aromas and vital energies and immortalizing them under glass. Their warehouse is a magical grotto. Noris and Giovanni trap the spirit of the mountains under glass: cream of Alpine raccichio, fresh and pleasantly bitter; soft and sweet sgrizoi, a field herb with a delicate liquorice scent; rose ketchup (which has nothing to do with tomato-based ketchup), made with just rosehips, salt, and sugar; the rare Mugolio, an oil of mountain pinecones after they dry under the sun for months – once used for seasonal maladies, the oil is now used to flavor gelato, ricotta, and cheeses; and finally, the poetic Fen, a mix of herbs and flowers that embody the visionary idea of “eating” a freshly-cut prarie. Primitive and delicious. The name comes naturally to mind: Primitivizia. 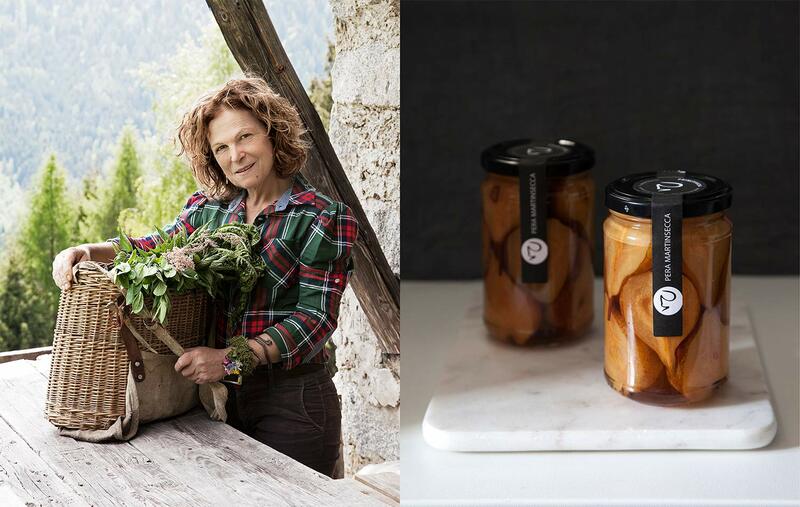 A primitive delicacy – primitive delizia in Italian – that conveys, with every jar, passion for the mountains, harmony with nature, gratitude for the gifts of the earth, and pure, uncorrupted simplicity. This same simplicity you can hear and see in the words and gestures of Noris and Giovanni, our illuminated and trusted interpreters of unreachable places and ancient wisdom.